Christian values, uplifting quotes, and reminders to pray for help or thankfulness are noteworthy elements of this spelling workbook. Phonics principles presented instruct children how to spell words with short and long vowel sounds, double consonants, special blends, digraphs oo and or, diphthongs, word endings, prefixes, suffixes, and compound words. Word bank exercises, crosswords, fill-in-the-blank, writing practice, rhyming exercises, and other fun activities are included, helping children gain familiarity with how words and sentences are constructed. Test sheets are included at the back of the book. Teacher-Parent help is required. This second edition features updated fonts and other minor aesthetic changes; two-tone pages don't distract from the content. 127 pages, softcover. 1st Grade. 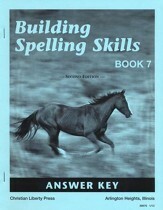 This answer key accompanies Christian Liberty Press' sold-separately Building Spelling Skills Book 1, 2nd Edition. Answers are arranged by unit and lesson, with page numbers for each unit given. Test word bank is included in the back. Stapled binding. Grade 1. Christian values, uplifting quotes and reminders to pray before each test are noteworthy elements of these spelling workbooks for grades 1-6. Phonics principles are emphasized throughout, along with advancing vocabulary through contextual works and lessons that include word meanings. A teacher's help is necessary, especially in the beginning books. Test pages are supplied in the back of each book. Word list exercises, choose the best answer, fill in the blank, list writing practice, sentence practice, categorization and other type questions help with reinforcement and retention of spelling words and principles. This second edition features updated fonts and other minor aesthetic changes; two-tone pages don't distract from the content. 128 pages, softcover. For Grade 2. Christian values, uplifting quotes, and reminders to pray for help or thankfulness are noteworthy elements of this spelling workbook. Phonics principles presented instruct children how to spell words with beginning consonant sounds, consonant blends, consonant digraphs, vowel digraphs, diphthongs ou and ow; words with ar and or; word endings; words with er, ir, and ur; and diphthongs oi and oy. 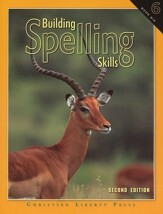 Vocabulary-building is emphasized through contextual exercises as well as a lesson dealing with word meanings. Word-bank, crossword, fill-in-the-blank, and other exercises are included, helping children gain familiarity with how words and sentences are constructed. Test sheets are included at the back of the book. Teacher-Parent help is required. This second edition features updated fonts and other minor aesthetic changes; two-tone pages don't distract from the content. 131 pages, softcover. 3rd Grade. 2nd Edition. 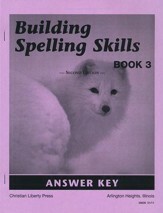 This answer key accompanies Christian Liberty Press' sold-separately Building Spelling Skills Book 3, 2nd Edition. Answers are arranged by unit and lesson, with page numbers for each unit given. Test word bank is included in the back. 42 pages, stapled "binding." Grade 3. 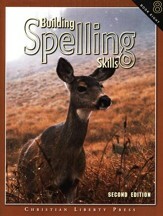 Christian values, uplifting quotes, and reminders to pray for help or thankfulness are noteworthy elements of this spelling workbook. Phonics principles presented instruct children how to spell words with suffixes -tion and -ion, silent e words, word endings, words with ch sounds, spelling the three sounds of wh and ch, con-sonant digraphs with f and ph, prefixes, compound words, irregular spellings, and names of time and measurement. Use of the apostrophe is also covered. 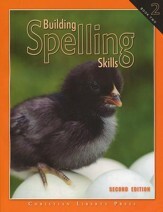 Vocabulary-building is emphasized through contextual exercises as well as a lesson dealing with word meanings. Word-bank, crossword, fill-in-the-blank, and other exercises are included, helping children gain familiarity with how words and sentences are constructed. Test sheets are included at the back of the book. Teacher-Parent help is required. This second edition features updated fonts and other minor aesthetic changes; two-tone pages don't distract from the content. 122 pages, softcover. 4th Grade. 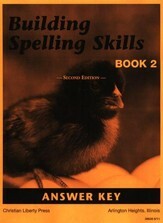 2nd Edition. 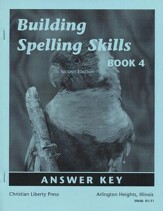 This answer key accompanies Christian Liberty Press' sold-separately Building Spelling Skills, Book 4, 2nd Edition. Answers are line-listed with the unit number and page number referenced. Stapled pages. Grade 4. Christian values, uplifting quotes, and reminders to pray for help or thankfulness are noteworthy elements of this spelling workbook. 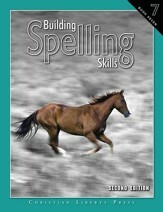 The concepts presented in this book expose students to a broad range of spelling themes that cover several subjects. The first six units help students learn to spell the names of major countries and cities around the world, including U.S. states and capitals. Later units in this book cover words that are often used in law, economics, science, theology, art, health, agriculture, music, government, and business. 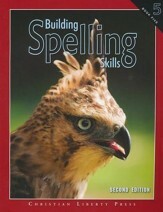 Vocabulary-building is emphasized through contextual exercises as well as a lesson dealing with word meanings. Word-bank, crossword, fill-in-the-blank, and other exercises are included, helping children gain familiarity with how words and sentences are constructed. Test sheets are included at the back of the book. This second edition features updated fonts and other minor aesthetic changes; two-tone pages don't distract from the content. 126 pages, softcover. 5th Grade. 2nd Edition. 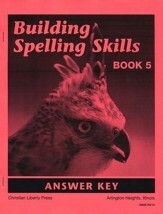 This answer key accompanies Christian Liberty Press' sold-separately Building Spelling Skills Book 5, 2nd Edition. Answers are arranged by unit and lesson, with page numbers for each unit given. Test word bank is included in the back. 45 pages, stapled "binding." Grade 5. Christian values, uplifting quotes, and reminders to pray for help or thankfulness are noteworthy elements of this spelling workbook. Phonics principles focus on vowel sounds, er, sk, k, and sh sounds, as well as suffixes and English, Latin, and Greek prefixes. 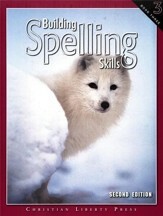 Vocabulary-building is emphasized through contextual exercises as well as a lesson dealing with word meanings. 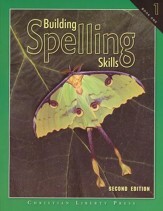 Word-bank, crossword, fill-in-the-blank, and other exercises are included, helping children gain familiarity with how words and sentences are constructed. Test sheets are included at the back of the book. Teacher-Parent help is required. This second edition features updated fonts and other minor aesthetic changes; two-tone pages don't distract from the content. 122 pages, softcover. 6th Grade. 2nd Edition. 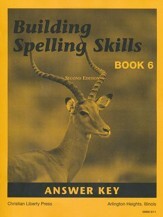 This answer key accompanies Christian Liberty Press' sold-separately Building Spelling Skills Book 6, 2nd Edition. Organized by unit and lesson, with student book pages referenced, this answer key provides line-listed answers for all student questions as well as final tests. 43 pages, stapled binding. Grade 6. Christian values, uplifting quotes, and reminders to pray for help or thankfulness are noteworthy elements of this spelling workbook. 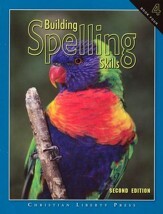 This upper-level workbook covers a good number of common prefixes and suffixes. Vocabulary-building is emphasized through contextual exercises as well as a lesson dealing with how living languages work. Word-bank, crossword, fill-in-the-blank, writing, editing, and other exercises are included, helping students gain familiarity word roots. Test sheets are included at the back of the book. This second edition features updated fonts and other minor aesthetic changes; two-tone pages don't distract from the content. 138 pages, softcover. 7th Grade. 2nd Edition. 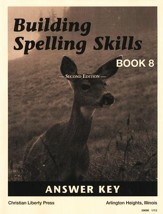 This answer key accompanies Christian Liberty Press' sold-separately Building Spelling Skills 7, 2nd Edition. Answers are arranged by unit and lesson, with page numbers for each unit given. Test word bank is included in the back. 42 pages, stapled "binding." Grade 7. Christian values, uplifting quotes, and reminders to pray for help or thankfulness are noteworthy elements of this spelling workbook. This upper-level workbook covers words from different languages, including words from Celtic languages, Arabic, Hebrew, Persian, Anglo-Saxon, French, Italian, Spanish, Latin, Greek, and more. Vocabulary-building is emphasized through contextual exercises as well as a lesson dealing with how living languages work. Word-bank, crossword, fill-in-the-blank, writing, editing, and other exercises are included, helping students gain familiarity word roots. Test sheets are included at the back of the book. This second edition features updated fonts and other minor aesthetic changes; two-tone pages don't distract from the content. 121 pages, softcover. 8th Grade. 2nd Edition. 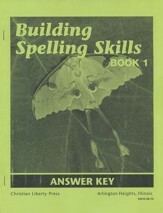 This answer key accompanies the sold-separately Building Spelling Skills Book 8, 2nd Edition. Line-listed answers are arranged by unit and lesson, with page numbers referenced. Stapled binding. Grade 8.